Dawson Dodd technicians are fully trained and equipped to install and service all major brand HVAC accessories, such as whole home humidifiers, programmable thermostats, whole house dehumidifiers and much more! Learn more about a few of our top-selling HVAC accessories below. 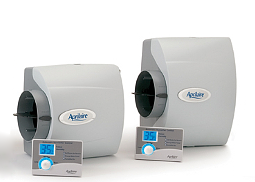 Humidifiers work together with your furnace to deliver desired humidity levels throughout your home. Maintaining proper humidity levels in your home is essential to maintaining indoor comfort during the winter months. Moderate humidity levels make you feel warmer at lower temperatures, which means you can set your thermostat lower without sacrificing comfort. There are measures you can take to lessen the effects of dangerous particles in your home. Since the home is essentially an enclosed system, heating, ventilation, air conditioning, and refrigeration (HVACR) contractors are able to tackle pollution head-on by moving the air through a high-efficiency air cleaner. 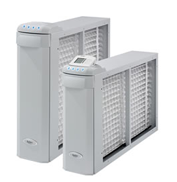 We offer both styles of air cleaners: furnace-mounted whole house units and portable single room units in a range of types from HEPA to Electrostartic to standard media filters. Older thermostats were manual and, while simple to operate, typically did not allow for any type of programming... and were notoriously inaccurate. It was common for these models to be as much as ten degrees off from what was originally set. 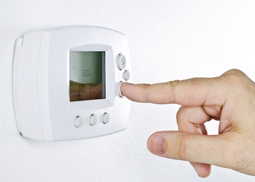 We offer a wide array of thermostats including programmable thermostats. A programmable thermostat is designed to maximize the performance of your home comfort system with reliable, accurate temperature control. Since it can be programmed to raise or lower the temperature of your home when you are away, it's very energy efficient. High humidity is a BIG problem here in Saint Louis. It can cause heightened allergies, uncomfortable conditions, an increase in energy consumption and even damage to your home. A whole house dehumidifier is a device that reduces the humidity of the conditioned air in your home. 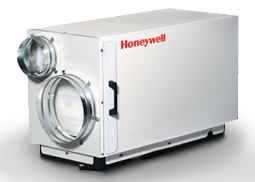 Unlike portable dehumidifiers, which can only control the humidity of a single room, whole house dehumidifiers are attached to your existing heating and cooling system and are able to reduce the humidity of the conditioned air in your entire home.